Today I am happy to present to you ANOTHER book tag! It's crazy how many tags Sabrina and I have already done! 8 or 9 now? Anyways, every month Sabrina and I have decided to come up with 10 questions. But each question will somehow relate to the theme of the tag. We welcome everyone to join, whether you are a book blogger, or just a reader on twitter or another site. and now, for the THEME REVEAL! okay I got quite a few that I need to read. At the moment, hmm, I'm really stuck in the Orvieto world right now. 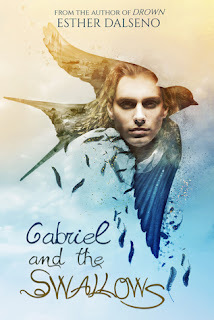 So I probably would say Gabriel and the Swallows by Esther Dalseno...whether that would be considered Spring-ish. I don't care. The only reason this question is tough is because I haven't been fully aware of the releases coming out *face palm* but I do know of a book that I have been DYING to get my hands on ever since I heard of it. And it's by the author who STARTED my reading love--Chanda Hahn-- anyways, the book is UNDERLAND by Chanda Hahn and it is out April 5th. I really want to do a little release day party on twitter. Only because I have been DYING DYING DYING for this book.
. . . Aldrik from Air Awakens. Don't ask . . . but a fire bearer prince wearing a bunny costume. Who CAME UP WITH THESE QUESTIONS?!?!?! oh yea, Sabrina and me. hehe. Splintered by A.G. Howard BECAUSE when they first go to wonderland. I don't want to say any spoilers, but that was Spring-y to me. 6. Name a cover with flowers on it? Ink by Amanda Sun, I really need to read the rest of that series. Ink was so good! it has flowers on it though. seriously, I'd have to choose Volatile from Gabriel and the Swallows (Esther Dalseno) and Aldrik (Elise Kova). No specific reason. I just really love BOTH of those characters. Something I WANT TO DO because I didn't get fully into this BOOK WORLD until June/July when I got back into my twitter. So, I'd say taking pictures of books around flowers and reading under trees and stuff <3 anything involved with being outside and having a book in hand. 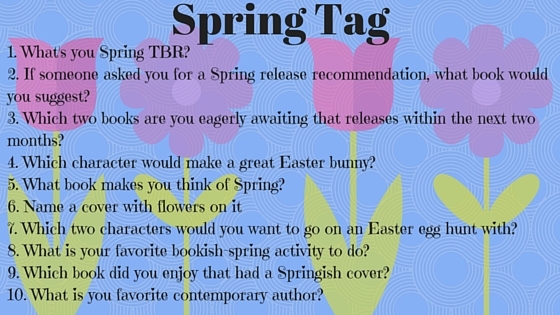 9- Which book did you enjoy that had a Spring-ish cover? I haven't read this book, but to me it has a spring-ish cover. The Dreamer by E.J. Mellow. 10- Who is your favorite Contemporary author? I hope you enjoyed! I'd love to see your tags! so tag me on twitter or comment the links below! I have been wanting to take pictures of books, but both) of my Kindle Fire cameras are horrid. I have been saving my money for a halfway decent camera and will be edited to start taking some book pics! My tag is up! Here is the link.